It had a fart can and visible pipes welded horribly together to allow the muffler to exit to the left, as in the pic above. 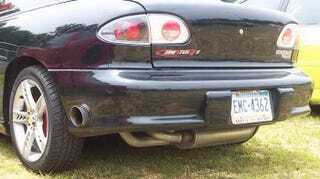 When GIS'ing for this post, I typed in "Cavalier side exhaust" and that was the first image. No doubt the owner of the car I saw last night did the same thing, but then executed it as badly as possible. Instead of a nice center mounted muffler and bent pipes leading to a tip that pokes through a clean hole cut in the bumper, this car had the aforementioned booger welds, crimped pipe, and a fart car exiting through a crude hole cut in the BOTTOM of the bumper, nowhere near the middle. The top image actually looks like a nice install. The car I saw last night was like one of those EXPECTATION / REALITY memes. I wish I had gotten a clear pic of it.